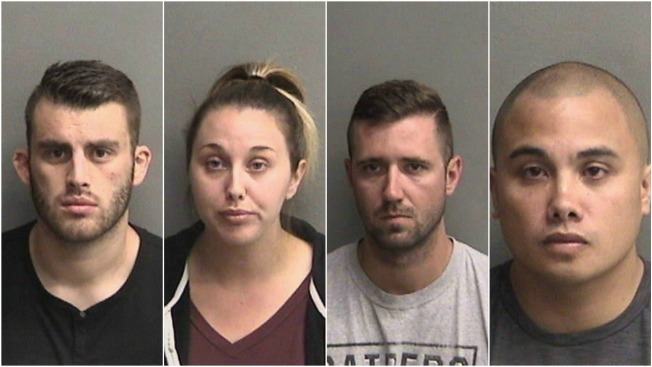 (L-R) Erik McDermott, Sarah Krause, Justin Linn and Stephen Sarcos are four Santa Rita Jail deputies who are facing multiple assault charges in connection with letting inmates throw feces, urine at each other, District Attorney Nancy O'Malley says. Three current Alameda County sheriff's deputies and one former deputy will be arraigned Tuesday on charges including assault and conspiracy to obstruct justice for their roles in the alleged mistreatment of inmates at the Santa Rita Jail in Dublin. Sheriff's officials said the four deputies allegedly facilitated and allowed an inmate to throw bodily fluids, including feces and urine, onto other inmates housed in a maximum security unit of the jail. The Alameda County District Attorney's Office filed the charges against Sarah Krause, 26, Justin Linn, 23, of Tracy, Erik McDermott, 27, of Concord, and Stephen Sarcos, 30, of Concord, on Friday but kept that information secret until today. Linn was charged with four counts of felony assault by a public officer, one count of dissuading a witness by force a threat and one count of conspiracy to obstruct justice. McDermott was charged with two counts of assault and one count each of dissuading a witness and conspiracy. Krause and Sarcos were each charged with single counts of assault for a single incident in the fall of 2016. Sheriff's spokesman Sgt. Ray Kelly said when the four deputies were arrested last Thursday that Krause, Linn and McDermott have been placed on administrative leave and Sarcos has resigned. Staff at Santa Rita brought the allegations of misconduct to the sheriff's office's attention in January and they conducted an investigation that focused on incidents at the jail between the summer and fall of 2016. Sheriff's officials said they determined that the allegations were criminal in nature and Sheriff Gregory Ahern assigned the investigation to detectives at the Eden Township Substation in San Leandro. More than 40 people were interviewed during the investigation, including sheriff's office employees, Alameda County inmates and inmates at various state prisons. Ahern said in a statement on Thursday that he is "deeply disturbed and saddened" by the alleged misconduct and criminal behavior. He said Krause, Linn, McDermott and Sacros "must now answer to these allegations." The four deputies are scheduled to be arraigned at the East County Hall of Justice in Dublin at 2 p.m. today. In announcing the charges, District Attorney Nancy O'Malley said, "These four deputies directed, facilitated, enabled and committed sadistic and terrorizing acts against several men whose protection fell directly within the responsibility of their positions as correctional officers." "The conduct of these four defendants violates the law and there is no rational explanation for their actions aside from abject cruelty and a disregard for the humanity of the inmates," O'Malley said. "It is the mission of the sheriff's office to protect life and property while providing humane treatment to those in its custody. Those entrusted with supervising and caring for individuals while incarcerated must be held to the highest ethical and professional standards," she said. O'Malley said the investigation in the case revealed that McDermott choked an inmate into unconsciousness.